In this book, top scholars of international relations assess the consequences of globalization for national security, identifying three distinct `processes' of globalization - the intensification of economic exchange, the flow of information, and marketization (the expansion of the set of social relations governed by market forces)-exploring how they can affect the capacity and power of states as well as conflict within and among them. 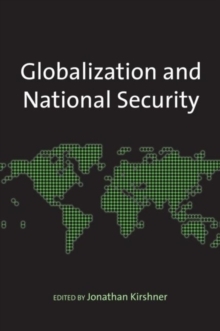 Though much has been written on the topics of globalization and national security, there has been relatively little in the way of a systematic examination of the impact that globalization has on a state's national security. These essays deal with how state-less actors, such as terrorists, utilize the benefits of globalization, changing the nature of the security game. Failure to account for the influence of globalization will make it increasingly difficult to understand changes in the balance of power, prospects for war, and strategic choices embraced by states.